Please read the Nautilus GPS manual thoroughly before use. Install the Nautilus GPS app to change regional settings and program an MMSI number. 1. Open the dive cap by releasing the latch. 4. Hold the red button for 5 seconds to begin distress transmission. *Two CR123 3V lithium batteries must be installed to operate the Nautilus GPS. 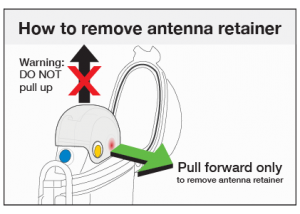 **Be cautious when removing antenna retainer. The antenna may spring out rapidly. Follow instructions when removing retainer. This Application requires access to the CAMERA on your mobile phone in order to operate the Camera Flash to communicate to the Nautilus GPS device. The Nautilus GPS app requires your device serial number to allow programming of the device. This information is not retained or transferred anywhere. It is strictly used to allow device programming. No personal data is otherwise collected, used, retained, or transferred anywhere from your mobile device. If this application crashes your mobile phone may send diagnostic information including your device type and software version to the Google Play store. This information will only be used to determine the nature of the software issue(s) to fix or repair software bugs. Thank you for using the Nautilus GPS app and your Nautilus GPS.